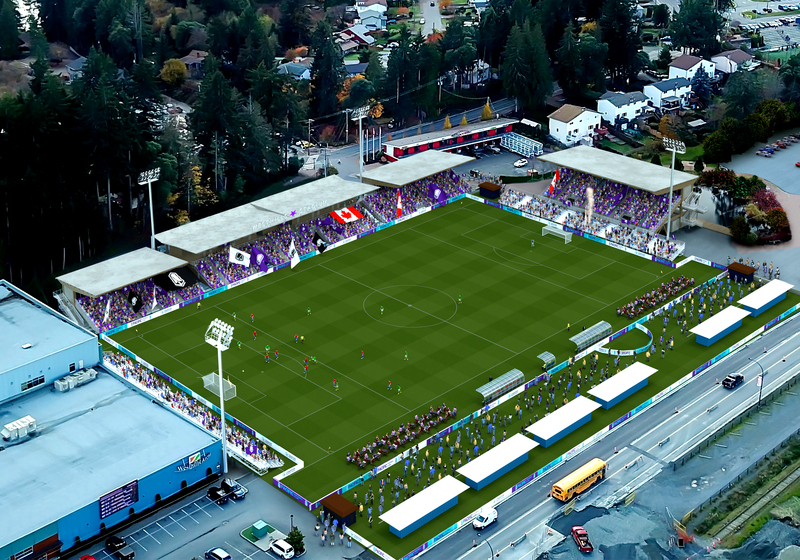 Pacific FC’s home will be as visually unique as Vancouver Island. Steps from the final kilometers of the Trans Canada Highway, Westhills Stadium sits on the edge of Vancouver Island’s vast wilderness — which inspired a portion of the club’s crest and identity. With Bear Mountain in the background, Pacific FC promises the rugged-yet-pristine feeling islanders are familiar with. 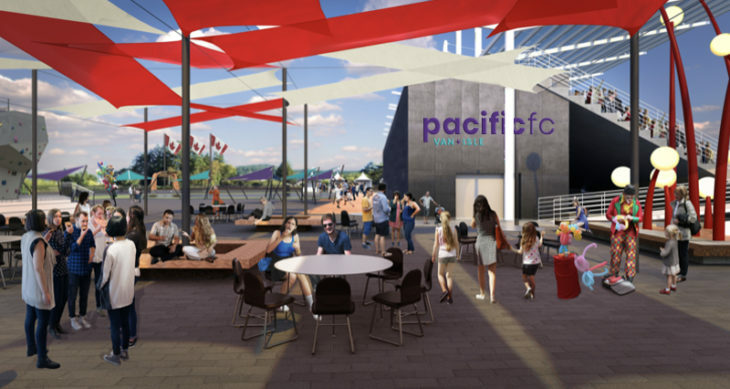 Pacific FC intends to weave those features throughout the entire building — like the ancient Douglas firs that lay roots along the province’s rocky shores. “The renovation is going to incorporate materials natural to the island — wood and stone and other elements unique to the area.” Bender expanded. The aforementioned renovations will breathe new life into the 10-year-old stadium by extending a covered south stand along the entire touch-line, adding supporter and family sections behind both goals and incorporating a new “standing-room” area that will expand capacity to 6,000. The additional stands are already being constructed overseas, promising fans a “steep and intimate” experience when they kick off in 2019. They’re also promising a select few season ticket members luxury treatment, including VIP pitchside seats that line the north touch-line. Members in this section will be treated to luxury services — table seating, with full food and beverage service and other amenities. Amenities like food trucks and a craft beer area will be available throughout the stadium to complement the bars and restaurants in the growing Langford area. 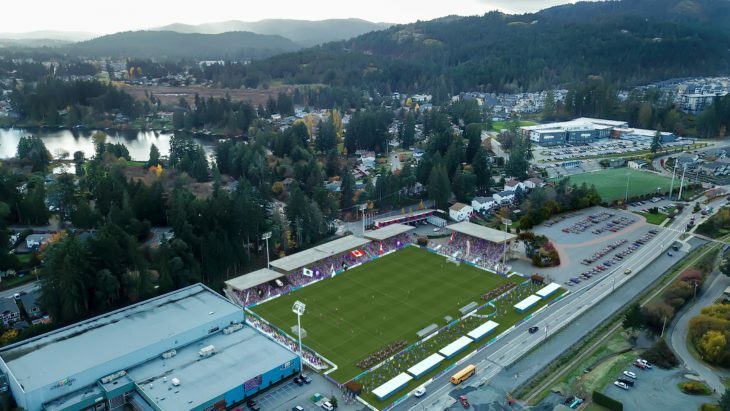 The stadium is based a 20-minute drive from downtown Victoria, where Pacific FC recently opened a retail store and office. As one of the “western communities” based just outside Victoria, Langford has made the most of its space, becoming one of the fastest growing municipalities on the island. Pacific FC is exploring complimentary transit to the stadium to make CPL matchdays even more accessible to the 360,000 who live in Greater Victoria and the surrounding island communities. “We’re working closely with BC Transit to make sure they have the proper capacity to handle the demand,” Bender said, adding the club could partner with private transportation companies to help carry the load. 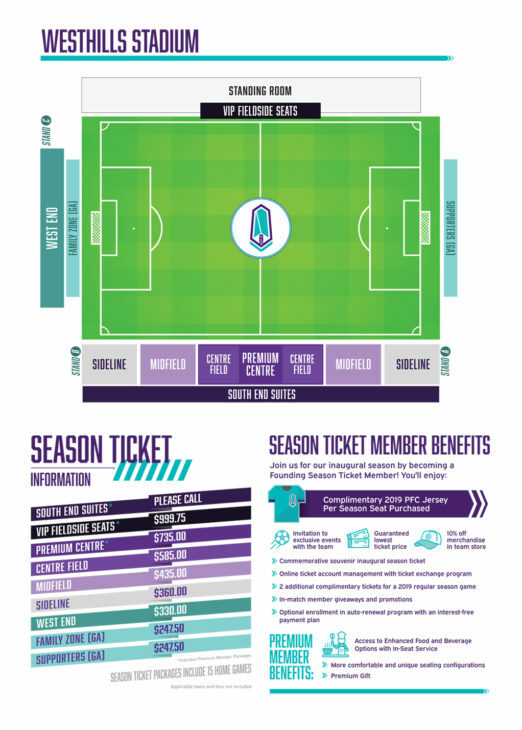 Along with getting fans to the gate in an efficient way, Pacific FC is also focused on keeping tickets affordable. The Supporters Section and Family Zone, on the east and west ends, respectively, will be general admission. The club intends to consult “local supporters groups to involve them early on in the process,” Bender added.